...And Weed Out Those Low Paying Affiliate Programs That Just Waste Your Time And Effort"
No matter what niche you are promoting, there are always many different affiliate programs that you can promote to earn commissions. But not all affiliate programs are equal. Some will make you a lot of money - while others are just a complete waste of time and effort. So how do you weed out these weak affiliate programs, and leave yourself with just the top earners? Now it's easy, with your copy of Affiliate Link Weeder. Just enter all the different affiliate links into Affiliate Link Weeder and the software will automatically split your traffic equally between the links. Just wait a short while to see which affiliate programs pay you the most money - then dump the losers. 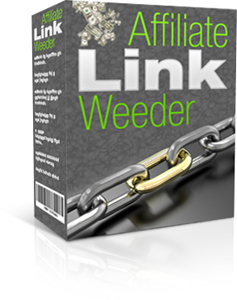 With Affiliate Link Weeder, you can apply this solution to any set of affiliate links. The tool will create a new script file that you upload to your website. Now just send all your traffic to the web address of the script. The script will split your traffic equally between the affiliate links. When you've decided which affiliate program works best, just use the setup tool again and delete the affiliate links you don't want - and then the script will just send all your traffic to the remaining affiliate link. Although the software was designed to split traffic between multiple links, you can also use it with a single affiliate link, by just entering one link into the box on the software tool. In both cases, the software will automatically "hide" your affiliate links, which can significantly boost profits. These links look "techie" and quite obviously affiliate links. These links are neat, clean and look just like links to pages on your own website. In an independently conducted test where the exact same email was sent to two groups of 4000 people - with the only difference in the emails being the link - over eight times as many people clicked on the cloaked link as clicked on the original affiliate link. That's over eight times as much money, without any extra effort! While I cannot promise that you'll see the same increase, you will almost certainly see an increased response when hiding your links. You only need to order one copy of this software, irrespective of how many sets of links you want to test. You can install your copy of the Affiliate Link Weeder script as many times as you want, on as many sites as you want - all at no extra cost. Affiliate Link Weeder is a great tool - but I'm going to make it even more profitable for you, by including full Master Resale Rights free! This means you can sell the software yourself and keep all the money. Just make one sale to recover your investment. I'll even give you a copy of this ready-made sales page to make it really easy for you. Just add your own order button to the ready-made page, upload to your own web host and you can be ready to take orders instantly. You can also use the software as a valuable bonus with other items you sell, or include it in packages and membership sites. Order now and your copy of this brand new software - complete with the valuable Master Resale Rights - will cost you just $9.95. I think you'll agree that's an amazing price. The low price of this software could go up at any time without notice. So please order now to ensure that you get all these benefits for this great price. You'll receive instant access to your software by Internet download. Requirements: The script set up software is for use only on PCs running Microsoft Windows. Your website must support PHP and MySQL (most paid for web hosts support these as standard). Earnings Disclaimer: The results of using this software are dependent on many factors outside our control. We are not therefore able to give any guarantees about the level of income that you will attain by using this software.